To understand the way children develop, Bronfenbrenner believes that it is necessary to observe their behavior in natural settings, while they are interacting with familiar adults over prolonged periods of time. His book offers an important blueprint for constructing a new and ecologically valid psychology of development. The book’s purpose: to offer a new theoretical perspective for research in human development. Bronfenbrenner achieves this goal superbly. . . The synthesis offered in this book is unique...The effect is a perspective on the field of human development that is exciting in its possibilities...This is a usable and practical book...a powerful teaching text...It conveys masterfully the mystery and excitement of scientific investigation. 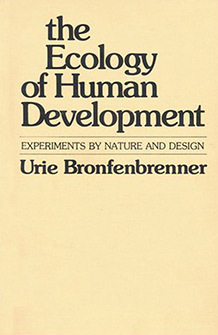 Urie Bronfenbrenner was a Russian American psychologist, known for developing his Ecological Systems Theory, and as a co-founder of the Head Start program in the United States for disadvantaged pre-school children.